I used the obvious colour scheme to create this Salt Water Taffy quilt block -- that colour scheme being what I would see on the seashore. 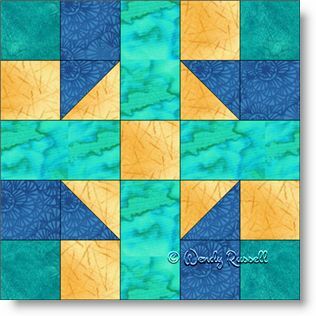 This five patch block is an easy one to get you started on your quiltmaking journey. This block is constructed as an uneven nine patch as I find that the simplest construction method for most five patch blocks, despite the name. The sample quilts illustrated are both laid out with blocks set on point, but they differ slightly as one has sashing strips to separate the blocks with setting triangles along the outside edge -- for a place to feature your quilting skills. The second quilt is made using blocks and partial blocks to complete the whole space. Enjoy!